As American shopping shifts from the brick-and-mortar stores to online retail, and even groceries have innovated for 21st Century consumers, agencies such as the USDA should reconsider how to best serve their constituents under their WIC and SNAP programs. With 16 million children living in poverty, these policies directly affect the outcome of countless kids in treatment for pediatric cancers in this country. If one in five families can’t put food on the table while their child is fighting cancer, perhaps programs already in existence can accommodate society’s trends in a responsive manner, and enter the Digital Era. Allowing the use of benefits like WIC and SNAP via online retailers will not be easy; an entirely new system of criteria and approval will need to be formed to identify and support retailers seeking to accept these USDA benefits via the online retail. Just as the USDA must be efficient in their management of SNAP and WIC, so to must low-income families trying to make ends meet. If the hour or two of travel and shopping can be done in a 15 minute online order, parents have more time to tend to their sick child, to work those two extra hours of overtime to pay their bill on time, or to simply save the travel costs of their grocery store trip. Thrive Market is a new online shopping club offering healthy foods and wholesome products at huge discounts. Their prices are typically 25-50% lower than retail. That means for the first time, organic, healthy foods cost the same price as heavily processed, conventional alternatives. Thrive Market provides annual memberships to the families within the Max Cure Foundation’s Roar Beyond Barriers program giving them an opportunity to receive healthy and organic meals to their families and ensure that parents and children both can focus on recovery and not ravenousness. Now Thrive Market is pushing a massive campaign starting on June 28th to bring food stamps into the 21st century and The Max Cure Foundation is supporting their plea and we invite you join us. Please sign the petition at ThriveAction.org to help us improve food stamp usage and make healthier food more accessible to those who need it the most, including children battling cancer. Please, on behalf of those children already in the most difficult struggle of their life, consider making the lives of their parents struggling to make ends meet that much easier by accepting SNAP and WIC benefits via online retailers. Good nutrition and regular meals are extremely important for a family battling a pediatric cancer diagnosis, and our families need all the help they can get. 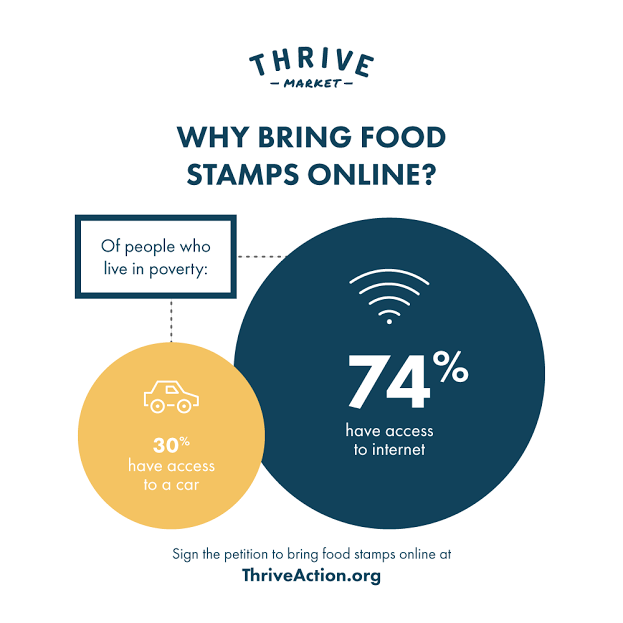 Join the movement and sign the petition at ThriveAction.org to make food stamps easier to use and redeemable online, and make healthy living possible for more Americans!